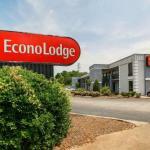 Free continental breakfast free Wi-Fi and Research Triangle Park three miles away let our guests lodge in a budget way at the Econo Lodge Research Triangle Park which also offers in-room microwaves and mini-fridges. The hotel has 86 economically priced rooms in a two-floor building with exterior corridors. Rooms feature free Wi-Fi and premium cable TV. Some rooms have pillowtop mattresses. Our guests love the convenience of in-room microwaves and mini-fridges and you will too. There's no reason to part with your money for breakfast at a place with "Econo" in the name. Here the spread is free and it consists of waffles toast muffins bagels cereal coffee tea and juice. The hotel also has laundry facilities a 24-hour front desk and free parking. The hotel is on Highway 55 just north of I-40 and three miles northwest of Research Triangle Park. Duke University is nine miles northwest and the University of North Carolina is 10 miles west. If you're a fan of the Durham Bulls from the silver screen see the real version at Durham Bulls Athletic Park six miles north. The Museum of Life and Science is nine miles north.